The IAA Fund and Asia subcommittees of the Advice and Assistance Committee organized a seminar in Chinese Taipei to support the development of actuarial education and the profession in Asia. The seminar, which took place on October 11 and 12, was attended by 33 people from 7 Asian countries (Bhutan, China, Chinese Taipei, Hong Kong, Japan, Sri Lanka and Thailand), Australia, the UK, and the USA. The IAA Fund provided bursaries for seven participants. Updates from regional associations and local regulation. 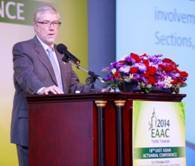 The IAA Fund Seminar was followed by the East Asian Actuarial Conference (EAAC) where President Brown gave one of the keynote speeches. His presentation, to 730+ registered participants, provided an overview of the IAA and focused on how to achieve retirement income security. This activity contributes towards achieving the IAA’s strategic objective to support the development, organization and promotion of the actuarial profession in areas of the world in which it is not present or is not fully developed. To learn more about the work of the IAA Fund, contact its Chief Executive, care of the Secretariat.